The tireless label of the Baroque gives us love songs of the 17th century, early Baroque Italian cello works, and suites by Johann Schmierer. I. Johann Abraham Schmierer: Zodiaci Musici (1698) (Ensemble Tourbillon/Petr Wagner). Accent CD ACC 24294. There are few composers who have vanished from music history to the extent of Johann Abraham Schmierer. We know very little about this composer’s origins, education, career and life journey. Some listeners, during or after hearing this recording, may well wonder why this music – despite its undeniable qualities and relatively early publication (already in 1902 in the tenth volume of Denkmäler Deutscher Tonkunst) – has not been recorded earlier. One reason is surely the fragmentary character of the collection, for six suites are obviously missing. The main reason why his music was ignored for so long, however, was most probably the composer’s name. Even an unbiased musicologist, interpreter or music lover who stumbles across his name ('Schmierer' is German for 'scribbler') may instinctively ask “Can a composer with such a name manage to write good music?” Now, thanks to Petr Wagner and his Ensemble Tourbillon anyone can hear for himself than he can indeed do so! From Gramophone: Johann Abraham Schmierer (literally ‘scribbler’) was discharged from Augsburg cathedral choir in 1680, but it was in the same city that Zodiaci Musici was published in 1698. Notwithstanding the unwieldy original title, alluding to the signs of the Zodiac, there is no discernible connection between the musical content of the six suites and astrology. The music reveals the typical fascination in late-17th-century Germany for French style, with each suite adopting Lullian character and structure (a French overture followed by seven dances). Schmierer wanted the suites to be multi-purpose, suggesting in his preface that they could be ‘for comedies, dinner music, serenades and other such cheerful gatherings’, and noting that they could be performed by just four solo string instruments and a harpsichord, or alternatively could be expanded by the addition of doubling wind instruments. Ensemble Tourbillon mix up approaches, performing three suites with only solo strings and continuo but adding flute to No 3 and two oboes and bassoon to some of No 5, and they opt to play No 6 exclusively on woodwind instruments (a smoothly cantabile quartet of two oboes, taille and bassoon). Fluent little dances are served effectively by the ensemble’s brightly alert and responsive playing: there is plenty of vitality produced by edgy string bowing in quicker dances (such as the Bourée in No 2), but in various tripping menuets and rondeaus rhythmical inégales are unforced and natural. II. 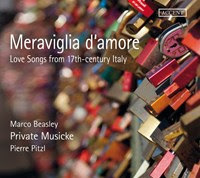 Meraviglia d’amore: Love Songs from 17th Century Italy (Marco Beasley/Private Musicke/Pierre Pitzl). Accent CD ACC 24330. The programme of this disc brings together pieces by Italian authors from the first half of the 17th century, both vocal and instrumental pieces, here performed by a period guitar ensemble. Many of the included works are signed by lesser-known composers, such as Antonio Carbonchi, Biagio Marini, Michaelangelo Galilei, or Angelo Michele Bartolotti, but the disc also includes pieces by Girolamo Kapsberger, one of the most famous theorbo players of his time, and Francesco Corbetta, “the greatest guitar player”, according to his contemporary Gaspar Sanz. The songs presented on this recording centre on love, moving in a labyrinth which includes hope, sorrow, optimism, disappointment and joy. Marco Beasley is a specialist in 17th-century vocal music and has some fine recordings to his name. His light and agile voice is excellently suited to these fine Italian delights of the early Baroque period. He is accompanied by Private Musicke under the direction of Pierre Pitzl, great experts in this kind of repertoire. From Early Music Review: This delightful CD presents a series of instrumental pieces by the likes of Cario Calvi, Antonio Carbonchi and a whole plethora of largely unfamiliar composers interspersed with songs by the more familiar Kapsberger, d’India and Marini. The original slant comes from the fact that Private Musicke can call upon two Baroque guitars, theorbo, cello and gamba, producing a wonderfully rich and lively sound in the instrumental pieces and a full and imaginative accompaniment to Marco Beasley’s singing. Clearly letting their instruments lead them, the instrumentalists play with a winning mercurial quality, strumming and thrumming their way through the repertoire, with inspired cross-rhythms and exploratory introductory sections which set this music in a very believable context. My one reservation is about the recorded quality, which is very close, and in the case of the singer a little edgy, giving his voice a brittleness which a more generous recorded acoustic would have alleviated. One advantage of the close recording, however, is the placing of the various instruments, which allows very clear give and take back and forth between the various players. These are passionate and musically imaginative interpretations of this repertoire, which in the likes of the masterly O del ciel d’Amor by Sigismondo D’India reach remarkable heights of expression and drama. It is easy to hear in these performances the theatricality of music which was being composed just as the medium of opera was taking shape. III. 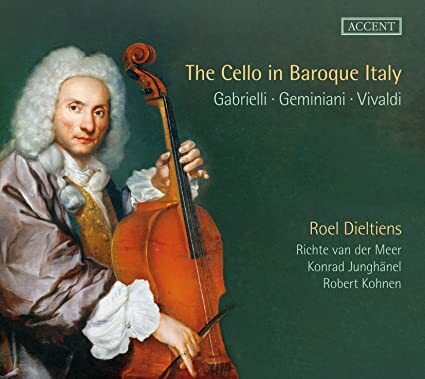 The Cello in Baroque Italy (Roel Dieltiens, ce/Anthony Woodrow, db/Konrad Junghänel, theorbo/Robert Kohnen, harpsichord). Accent CD ACC 24304. From MusicWeb International: In the 18th century the cello developed into one of the main string instruments. It was often used in the basso continuo but increasingly also as a solo instrument. Its history is not straightforward. The word 'cello' seems to have been used for the first time in 1665 by Giulio Cesare Arresti, an organist and composer from Bologna. That doesn't mean that the instrument he referred to did not exist before; it was probably just a new name given to an already existing instrument. In the first half of the 17th century no fewer than 24 different words were used for a string bass instrument. These don't always refer to different instruments; several words may have been used for one and the same. It is very hard to establish which kind of instruments are meant.